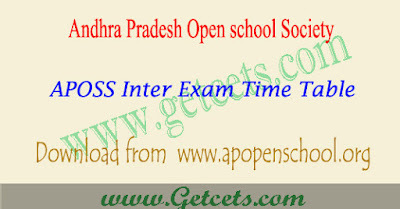 AP open inter time table 2019-2020, aposs exam dates : AP open school inter time tables 2019 pdf download from www.apopenschool.org, Manabadi.com. APOSS intermediate Public exam time tables is released for May 2019 exams. Students can check AP open school inter exam schedule from official website. We may update aposs inter time table 2020 for next year. Candidates who had enrolled for AP Open School Society (APOSS) intermediate Exams to be held in the month of April 2019 can also check the time table below. Thousands of students will be appearing for the inter Exams in April 2019 across the state of Andhra Pradesh. APOSS Intermediate Exams will commence from May 1, 2019. Andhra Pradesh Open School Society, APOSS Amaravathi has published AP Open School timetable 2019. The students who are going to appear for the intermediate exams download the timetable, aposs hall tickets and ap open school results 2019 from official site. Frankly ask us by comments and share this AP open inter time table 2019, aposs intermediate exam dates 2019-2020 article with friends on social media for appreciation for us and we may again continue for the AP open inter time table 2019, aposs inter exam dates 2020-2021 and APOSS inter hall tickets 2019. Practical public examinations for ap open inter courses will be held on from 9th May to 13th May 2019 including Sunday.